Hugo is a little starfish. He finds his life dull. Tired of feeling sad, one day he sets off to find happiness. After much searching, he discovers something that makes his heart do a somersault! Sharing with others is the only thing that makes him truly happy. Adults strive to teach children to share with their communities. Encouraging children to give teaches them empathy, as well as a sense of social responsibility. Children can feel empowered by giving and sharing with others. This book is a great way to teach EMPATHY and the CALENDAR. Meet HUGO - a little starfish with a BIG HEART. His passion is to make others happy but he still has a lot to learn. Luckily he does not only have a big heart but also a CURIOUS MIND. In Hugo, children, parents, and educators will discover a lovable and engaging role model with whom they can identify. Suzy Liebermann has written this charming series of children's books to help educate children about their feelings, their attitudes, their choices, and the consequences that follow. We are sure you'll agree that life skills and character traits are two of the most important lessons to teach the young. 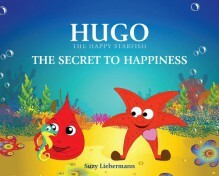 The key theme behind the HUGO THE HAPPY STARFISH series is that building character based on a positive attitude leads to a happy, self-confident and successful human being. We believe this distinctive way of sharing a "message" through the medium of an exciting narrative is what has given the books their charm. The stories were developed in conjunction with Suzy's teaching experience at an International Baccalaureate® School and support the different learner profiles and attitudes of the IB PYP curriculum.